This is an easy Taiwanese beef noodle soup recipe(如何做台式牛肉麵) , which in fact may be the national dish of Taiwan. It is rich with Asian flavors, and the Bald Chef will show you all of the ingredients, and cooking instructions to create this delicious beef noodle soup recipe. I like to use the wider wheat noodles, obviously they are very many variations of this dish, for me, I like the thicker stock that is produced of my recipe. This recipe will show you exactly how to make homemade Empanadas Recipe. The recipe includes instructions on how to make the dough, filling, and 2 variations of dipping sauces. Empanadas are popular around the world, especially in Latin America. Though there are many versions in Asia. This recipe for a homemade Red Velvet Doughnut Hole Cake is not only delicious, but a showpiece dessert. The final results are absolutely awesome and I highly recommend you try this recipe. When you slice into this cake it exposes the chocolate frosted donuts holes so that the cake has little round vanilla circles. Best Chicken Chow Mein Recipe is the Bald Chef’s best recipe for Chinese Chicken Chow Mein. I will show you step by step how to cook this classic Cantonese dish. Best Chicken Chow Mein Recipe a very authentic recipe much like you would find in a Restaurant Southern China. One of my first experiences eating Chinese Food was in the 1950’s and 60’s. There was not much in the way of verity in the few local Chinese Restaurants. These Chinese Restaurants all had Chow Mein on their menus, but it was made with Canned Fried Noodles and Canned Chinese Vegetables. The Triple Delight or sometimes reverend to as Happy Family is a great Chinese recipe. The Bald Chef show you how to cook this Chinese restaurant carry out classic recipe for Happy Family or Triple Delight often found on the Chef Specialty section of almost any Chinese restaurant. This is a great stir fry recipe that includes Shrimp, Chicken, and Beef. I f you are looking for the best Chinese recipe for your family this is a great recipe. If you love American style Chinese food you will find this recipe is easy to cook. Its hot its Summertime and you are looking for a cool refreshing cocktail that features watermelon . Well look no farther The Bald Chef has an excellent recipe for the Watermelon Martini Cocktail Recipe . Do you want to do the Watermelon Crawl then this just might be your cocktail.The Watermelon Vodka Martini Cocktail recipe. 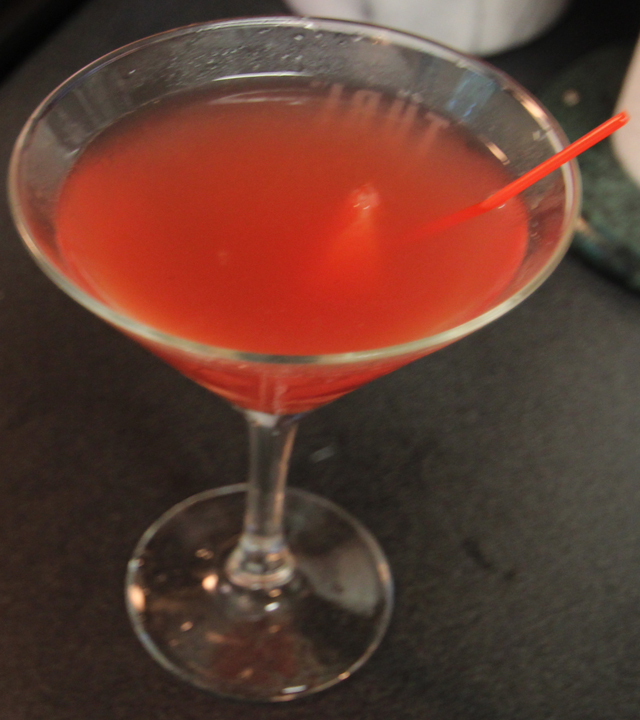 The Watermelon Martini. 2 0z of good quitilty Vodka, , and 1/2 oz of Watermelon juice. Best In Class French Fries Recipe.You want to know how to make the Best In Class French Fries Recipe at home? This recipe for homemade french fries will detail not only all the ingredients that will be needed, but the complete cooking instructions. Well the bald Chef has a recipe for French Fries that beats McDonald hands down. You need to start with a Russet Potato hand cut the potato into fries of even size. Always cook your French fries in peanut oil. This video by the bald chef shows you how to make homemade French fries. You can make great homemade French fries that taste better than you can buy at any fast food joint! Did you know French Fries did not come from France but Belgium? 2 Russet Potatoes cut into nice square slices. The Bald Chef shows you how to make a Twice Baked Potato.Twice Baked Potato Recipe is a unique way of serving the classic , and simple potato. This recipe goes great as a side dish for steak, beef roasts, or just about any meat you can think of. So if you want to include twice baked potatoes at your next dinner party or just for your family let The Bald Chef help. Wash your potatoes and set aside. Pre heat your oven to 350 deg. Bake as many potatoes as you have guests and bake them for about 55 minutes. Remove your potatoes from the oven and set aside to cool for 10- 15 minutes. With a knife ut a box at the top of the potato just as deep as the potato skin. Remove the cut skin of the potato and set it aside. Remove the potato with a spoon from the skin, and place in a bowl. In the bowl filled with the potato add 1 Tablespoon sour cream, 1 Tablespoon Sea Salt, 4 rounds of cracked black pepper, 1 Tablespoon butter. At this point mash the potato until all ingredients are mixed and you have chunky mashed potatoes. Spoon the potato mixture bake into the potato shin, and top with 3 Tablespoons of grated sharp cheese, and crown with 1 teaspoon chopped chives. Return the twice baked potato to the warm oven to melt the cheese, and serve. How To make Paella de Marisco. This is the recipe for Spanish seafood Paella that tastes great. The bald Chef shows you how to cook real Paella Valencia, located in eastern Spain on the Mediterranean Sea. Saffron give this rice dish it’s yellow color. The recipe features, Shrimp, Squid, Lobster, and Clams. This is a easy recipe to cook and I believe you will love it. These are many ways to cook this recipe from Valencia, Spain but I like the Marisco version best. Potato Croquettes are Mashed Potatoes breaded and deep fried. Potato Croquettes are quite popular in Belgium. Best Potato Croquettes Recipe you step by step how to make this great side dish. This recipe can be made from leftover Mashed Potatoes or fresh made Mashed Potatoes. Though Croquettes recipes come from all over the world these are more akin to the way they are made in Belgium. Give this recipe a try these are a great dish if you are looking for a new way to cook Potatoes. Are you looking for the best recipe for homemade macaroni and cheese? Well you may have just stumbled upon this decadent Best Macaroni And Cheese Recipe. Macaroni and Cheese is one of America’s favorite comfort foods. If you want to learn how to make the best macaroni and cheese recipe you have ever tasted you have found what you are looking for. I will show you step by step how to cook classic homemade American Macaroni and Cheese. My secret recipe includes 2 types of Cheddar Cheese infused in a cheese sauce that is absolutely decadent. The sauce is cheesy and creamy. For the best Macaroni and Cheese recipe one must obtain the quintessential oven browned crust and oh yes, this easy mac & cheese has it. This recipe is absolutely family-friendly and if you decide to cook this recipe you will be more than satisfied. Cook the Korean Shin Ramyun Noodle per instructions. just before the soup is cooked add the 1/4 pound od sliced beef, and fresh washed spinanch to flavor the soup with the meat, and vegtables. Add the Sriracha sauce to taste for a good quick lunch on the run!